More than half of North Holland used to be under the sea. Thanks to Dutch ingenuity, these polders (reclaimed land protected from the sea by dikes) are now farmlands, towns and municipalities. North Holland (Noord-Holland) has a population of over 2.5 million people. 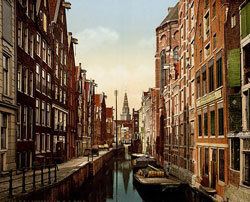 Its great urban centres are concentrated in the south and include Amsterdam, the Netherlands’ celebrated capital. Haarlem, the provincial capital, is a major source of one of the Netherlands’ most famous exports—tulips. Alkmaar is one of only four cheese markets in the Netherlands. The weighing and selling of famous Dutch cheeses such as Edam and Gouda on the streets of Alkmaar from April until September draws a lot of tourist attention—wheels of cheese being carried on stretchers to be weighed is one of the most popular and enduring images of the Netherlands. 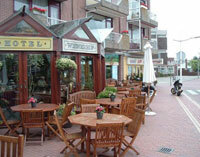 Den Helder is a city that has much of its history and importance tied to the sea. It was a major centre of shipping during the Dutch Golden Age that saw the country rise to become one of the world’s wealthiest and most powerful nations. In the 19th century, the 75-kilometre-long North Holland Canal was dug from Amsterdam to Den Helder to shorten the sea route to Amsterdam, and the tallest cast-iron lighthouse in Europe, the Lange Jaap, was erected there some 50 years later. Hoorn is 650 years old and in recent decades has become an “overflow city” that provides an alternative to living in cramped quarters in Amsterdam. Hoorn offers them modern new residences with spacious gardens instead. Zandvoort is a popular seaside resort town with an important racing circuit, and more than half of the jobs in the municipality are related to tourism. Going to the neighbourhood of Zaanse Schans in the town of Zaandam is like stepping back in time. Here, people live and work alongside historic windmills and dark green wooden houses along the river Zaan. The neighbourhood is an Anchor Point (heritage site) along the European Route of Industrial Heritage network that lists the most important industrial places in European history. North Holland’s economy comes mostly from commercial services, various industries and the building trades, and fishing and agriculture.